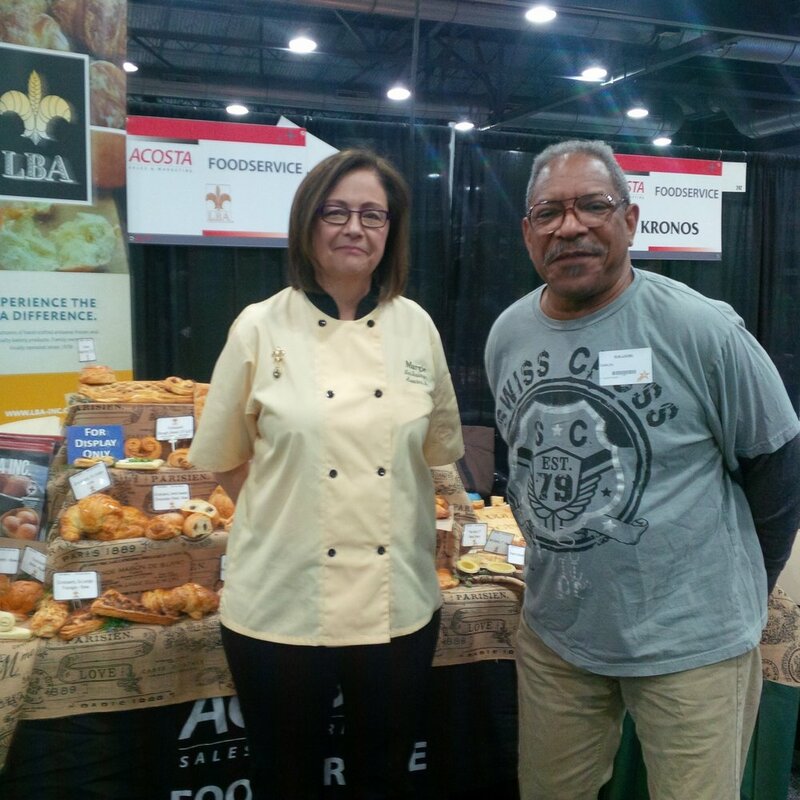 On The Road: LBA Owner Works the Booth at FSA Portland Food Show — LBA, INC.
Nearly forty years ago, Margie Robert, an LBA owner, was hitting the streets the old-fashioned way, delivering fresh-baked LBA croissants, pain au chocolat, and brioche to local Seattle hotels and restaurants on foot. While no longer making deliveries on foot, Margie was on hand (and on her feet) for a long day passing along pastry tips to customers at the Food Services of America Portland (FSA) annual spring food and product show at the Portland Metropolitan Exposition Center in Portland, OR on May 6th. Margie Robert, owner, with Ron Livingston, B&I café manager and winner of the LBA raffle of free pastry cutting tools. Ron received free LBA baking training, spoke about accolades from customers on his fresh baked Danish and other pastries. His creativity and passion for good food, successfully transferred to LBA frozen dough. Long-ago abandoning fresh-baked, in-person deliveries in favor of frozen dough distribution on distributor trucks, Margie, current Vice-President of Finance and Strategic Initiatives, has nonetheless retained a keen interest in the people behind the purchase orders. Speaking of her experience at the FSA show, she said, "As an owner, it was great to be out there hearing about what end users are actually looking for--what the challenges are that they have in their businesses and being able to look at how we can partner with them to meet their challenges." While "big" and "corporate" are getting a bad rap in consumer foodservice preferences, "small" and "local" are having a sustained moment. Even with hyper-locality trending, it's still not customary to find an owner behind the food show booth. Speaking about her experience last week, Margie said, "It was a great show--very, very busy. FSA did a great job. They seem to really care about their customers which is nice to see in a corporate environment. Their customers seem really happy." The beauty of a family-owned business is that even the people at the top dig in and get their hands dirty. In Margie's case--covered in flour! Stay tuned for more "On the Road" appearances from LBA!